Tucked away next to Aruba’s iconic 200-year old Old Dutch Windmill and just a stone’s throw away from Palm Beach’s high-rise resorts is one of the top restaurants in Aruba to check out in 2018. The name of this unpretentious establishment is “Delicious” and Chef Annelotte Ellis is the owner. We first shared news about this exciting new restaurant project in late 2017 (read more and get a vegan Easy Siboyo Tempera Recipe ), so we were happy to hear that Chef Ellis’ dreams came to fruition and Delicious is now officially open. Annelotte comes from a clan of legendary local chefs–her family is well-known for their restaurant Papiamento, a highly acclaimed authentic Aruban establishment that opened in the early 80’s. It’s among the top restaurants in Aruba for authentic cuisine and historic atmosphere. An award-winning pasty-chef herself, Chef Ellis’ artistic prowess is evident in the presentation of her dishes. She is known for her creativity and artistic design in the kitchen, with many of the dishes featuring edible flowers and sculptural details as garnishes. 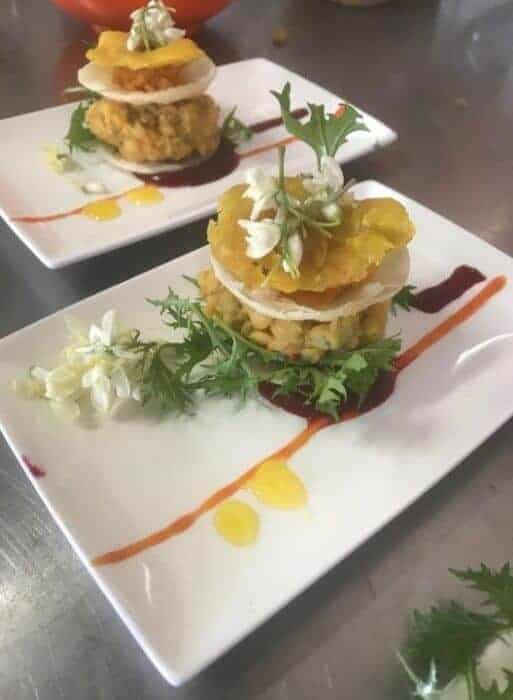 Check out her version of linzen (lentil) curry stew with fresh red beet dressing on gluten free puff pastry with fried plantain, pepper flowers, local Aruban flowers, red pepper dressing and lemon dressing. You’ll never look at stew quite the same way again. 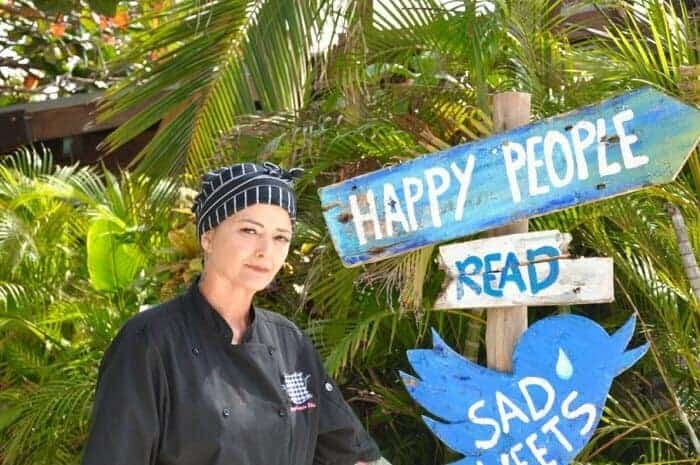 Chef Ellis earned a following of devoted food fans while helming the kitchen as the private chef of Aruba Ocean Villas in Savaneta where we first met her. I am still dreaming about the deep-fried vegan brie Annelotte made for me there! But we knew she had always dreamt of opening her own place… and now she has. 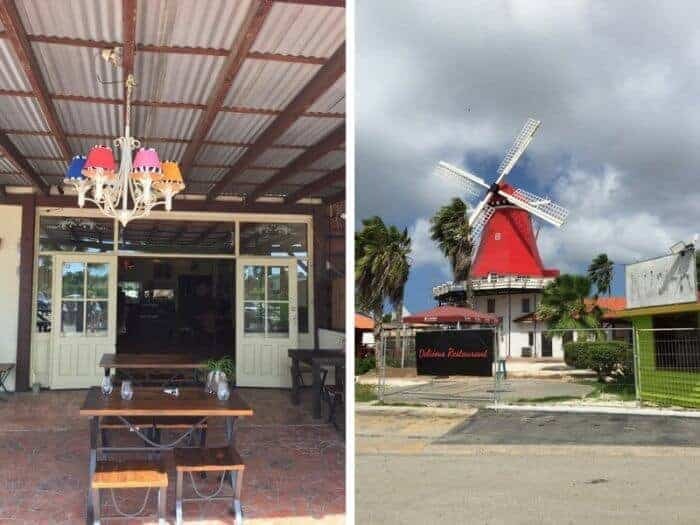 Though it is a very tiny enclave, with a few tables inside and a few more outside tucked beneath the famous historic red windmill, it is the ideal place for Annelotte to begin to carve out her own culinary legacy on this island. And she’s still experimenting with where she wants it to go. As a true artist, Chef Ellis is a great fan of surprises and her free spirit cannot be pigeon-holed into any one specific style. 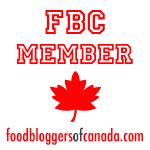 Her focus is on fresh, local ingredients and she follows her intuition and goes where creative inspiration takes her. For a unique culinary adventure, show up with an appetite and an open mind. You will not be disappointed. Annelotte’s enthusiastic sense of originality is refreshing so it’s no wonder the local community is excited to see this new restaurant hit the scene, especially with her family’s culinary pedigree. And if you’re vegan, you will be over the moon here-but be sure to call ahead to let her know you’re coming as they are still working on a permanent menu. What we do know for sure is that the menu promises to include some fabulous vegan options. I was lucky enough to stop by the new Delicious in December 2017 during their soft opening where I indulged in a decadent piece of vegan sweet potato cheesecake. Incredible. And now there’s plenty of buzz from influencers in Aruba’s vegan community since my visit. Changemaker and vegan activist @VeganAruba posted this update following her visit to Delicious. Chef Ellis’ creativity is also showcased in the eclectic handmade décor of the restaurant (think avant-garde mannequin art, zebra print lampshades and DIY dreamcatchers). This cute little eatery may just be getting on their feet, but with Chef Ellis on board we can expect Delicious to become a serious culinary force to be reckoned with in 2018. It’s also a promising new addition to the vegan food scene in Aruba. All of which adds up to Delicious being one of the top restaurants in Aruba to try right now. But remember it’s tiny! So call ahead. Details: Delicious offers indoor and outdoor seating and is typically open for lunch and dinner. It is also equipped to cater events and special occasions. Beer and wine are available. Vegan Cuisine: It’s best to call in advance for vegan cuisine. Aruba Tourism Authority: Get travel tips, maps, and other visitor information on the official Aruba Tourism Authority website. 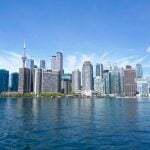 For more tips on eco-adventure and vegan-inspired travel to the world’s best sun destinations, check out these other posts on vegan travel or visit the Vegan Vacationista website by Jessica Percy-Campbell. That Lindzen (lentil) curry stew certainly looks like it’s to-die-for. My husband would love to have that for a meal. And ARuba is an intriguing country to visit! 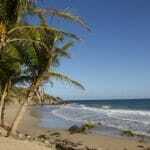 I have wanted to visit Aruba for more than 35 years. Ever since my sister-in-law gave us a beautiful wood carving that she bought for us in Aruba. Your post has made me want to plan a trip there! Aruba is one of the first places I traveled to in my 20’s, and I think it’s high time I return! The food at Delicious looks so yummy — I’m making note of it. I love colorful places and food and this definitely looks amazing and innovative with the use of local ingredients. I want to go visit now. We haven’t made it to Aruba yet, but it is on our radar. Now we have a place to dine once we make it there. 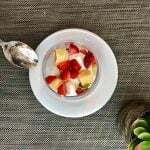 Thanks for sharing this delicious article.